KYOTO - On the evening of Oct. 1, Dr. Tasuku Honjo was in his office at Kyoto University discussing a manuscript with two of his colleagues when a secretary came dashing in to announce there was a call from Sweden. Could he take it? 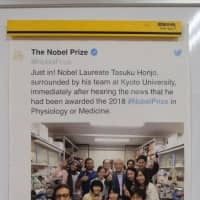 Shortly afterward, details of that call would make news around the world: Honjo, 76, along with Dr. James Allison, 70, of the University of Texas MD Anderson Cancer Center, were jointly awarded the 2018 Nobel for Physiology or Medicine for their pioneering work in immunology — work that has helped pave the way for a new generation of cancer treatment and drugs. 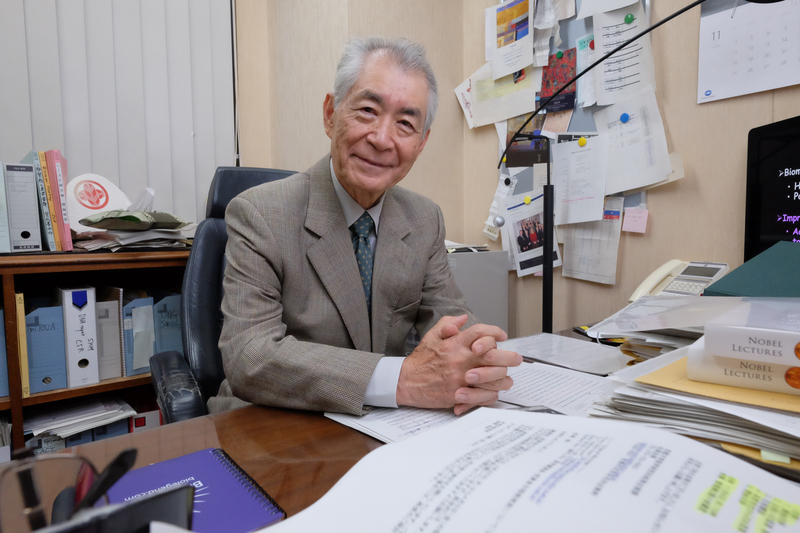 In a recent interview in the same office where he took the Nobel Assembly’s call, Honjo admitted his surprise — it’s not every day one is informed of a Nobel Prize win — but he was also skeptical, for the same reasons. “The person who called me raised the issue (of prank calling), and so he asked me if I would like email confirmation during the call,” Honjo said. After all, it’s only natural for a scientist to seek verification. The Nobel, which will be awarded next month in Stockholm, is the latest in a long list of awards Honjo has received for his work in immunology, and more specifically for his 1992 discovery of PD-1, a so-called checkpoint protein in immune cells called T-cells that acts as a type of “off switch” to help keep the T-cells from attacking other cells. The seeds of that discovery, along with Allison’s own research, opened up a new front in the fight against cancer, one that focused on using the body’s natural defense system. The revelation of checkpoint inhibitors has been so important that one Stanford researcher has likened it to the discovery of penicillin, which has saved millions of lives. 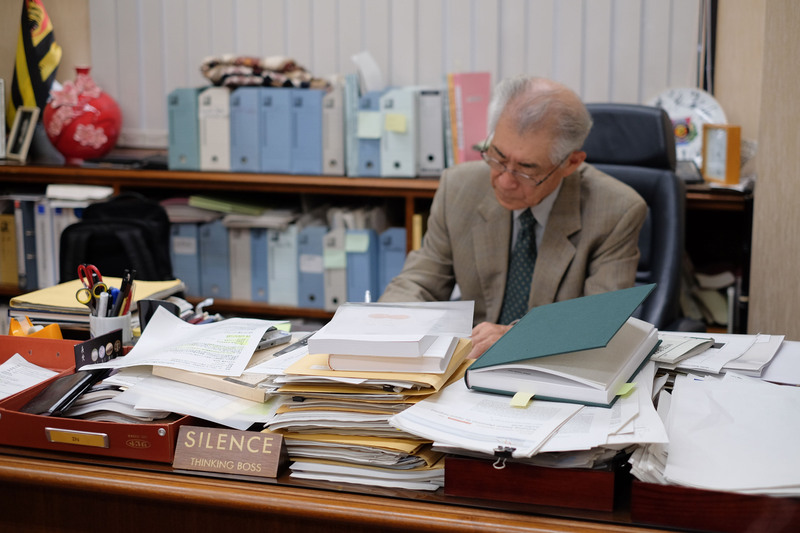 Honjo, a fluent English speaker, is soft-spoken but resolute, including in his belief in the importance of basic sciences in Japan, of which he has been a long-time advocate. “The government’s duty is to support basic sciences,” Honjo said, adding that when an application becomes apparent, industry steps in. But that belies an understanding and appreciation of scientific inquiry, which the Nobel winner said can’t be rushed and needs long-term, careful observation and cultivation. Life sciences are still in the “very primitive” stages, Honjo said, adding that the field remains “totally unpredictable” — no one knows what they may stumble upon in their research. As an example, Honjo noted his team’s seminal research in immunology. In the initial stages, he had no clue that it would veer into the fight against cancer and, ultimately, lead to the development of a new drug that helps battle the disease. “When we first isolated PD-1, we didn’t know what the function of this molecule would be,” he said. 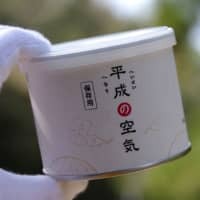 Honjo recalled being driven to the edge a number of times, nearly abandoning the project after years of labor bore few results. “But while we were working on it for almost 10 years, we realized this is a very important molecule to regulate the immune system,” he said. 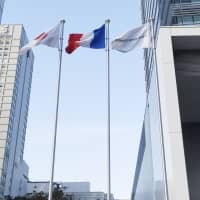 Acknowledging that developing a new drug is a huge and costly gamble, Honjo alluded to the need for the Japanese pharmaceutical industry to take on more imaginative, albeit risky, projects. Honjo — who said the nation’s pharmaceutical sector remains tiny and conservative, with just one company among the world’s top 20 drug firms — credited the foresight of Medarex, a U.S. company now part of conglomerate Bristol-Myers Squibb Co., for the eventual development of the cancer drug Opdivo. The American biotech firm had collaborated with Ono Pharmaceutical Co., an Osaka-based company that Honjo’s lab had partnered with to patent his discovery. A graduate of Kyoto University, Honjo spent time early on in his academic career as a researcher in the United States before returning to Japan, eventually returning to his hometown and alma mater after teaching at several universities. 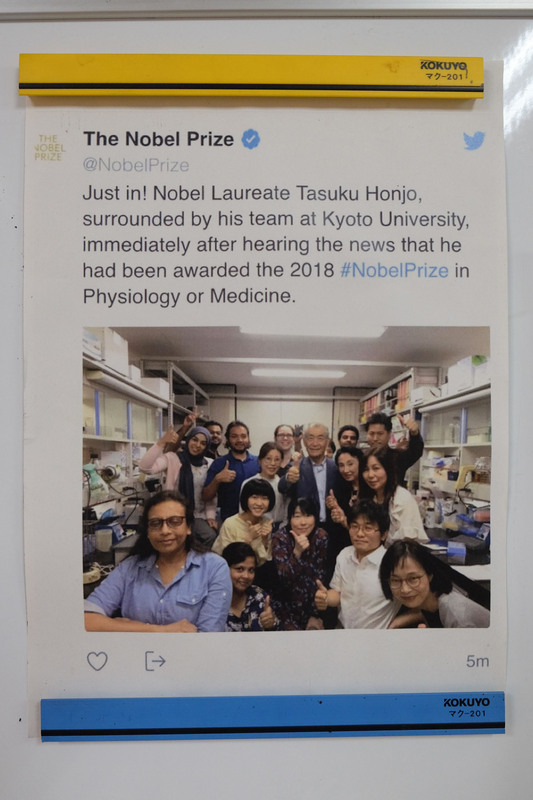 At the age of 63, he began a short-lived retirement from Kyoto University, one that ended a few years ago when he returned to run his namesake lab at the prestigious institution, where he is the principal researcher. In this position, Honjo has also used his ever-growing cachet to advocate for diversity. At a point where Japanese politicians are debating legislation to allow for an increase in the number of foreign workers in the country, Honjo’s 30-strong laboratory offers a prototype: The lab team is comprised of researchers and students from India, China, Oman, Egypt, Bangladesh, Australia, Iran and Japan, with women outnumbering men. Honjo said he strives to maintain a diverse team, both in terms of gender and nationality. 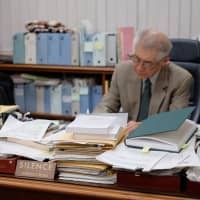 Since his retirement and subsequent re-hiring, many more foreign researchers have applied to his lab than Japanese, which he puts down to his age. “It’s a total different mentality,” he said, noting that Japanese graduate students tend to look for long-term stability, while foreign researchers don’t need him to take care of them forever. Securing the future of the lab is a concern that Honjo will focus on until he retires — for a second time — though he has no plan to do so anytime soon. Currently, the lab receives financial support from Ono Pharmaceutical, but Honjo aims to boost funding by setting up a special endowment, specifically to support young scientists. He said that the size of endowment funds at U.S. universities can have a considerable effect on the research landscape. “Young professors can be supported to set up their own laboratory,” he said. While Kyoto University and universities nationwide run endowment funds, their size, as well as that of donations, pale in comparison to the U.S., where Harvard University leads the way, managing a $39 billion endowment fund. As a first step in setting up an endowment, Honjo said he plans to plough his prize award and money secured from patents into the fund. 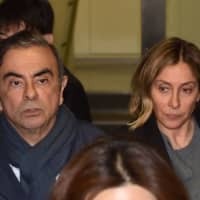 “Unfortunately this should have happened before, but it hasn’t yet,” he said, adding that Japan, despite having many wealthy individuals, does not see many funds spent on philanthropic purposes. 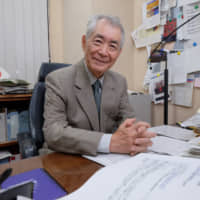 “I think people have to learn, so that’s why I want to start this, and when I start and the university advertises this, many people may” follow suit, Honjo said, noting that he hoped other universities in the country would co-opt his model to better serve their researchers and compete with overseas universities. “I know there are so many rich people in this country, and yet they don’t know how to spend their money,” Honjo said, only half-jokingly. But apart from the never-ending battle to secure more funding, Honjo spoke of another experience seared into his mind: his encounters with patients whose lives were saved as a result of the medical advances he paved the way for. “I’m pretty sure this is the case for Jim Allison too, but when I meet, or when I met a patient who came to (me) and said, ‘My life was saved by your drugs,’ that was the most rewarding moment,” he said quietly as the interview drew to a close.